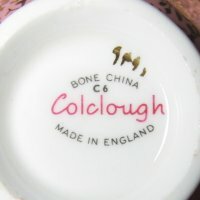 Vintage Colclough Pink Gilt Tea Cup and Saucer - Lavish Decoration! 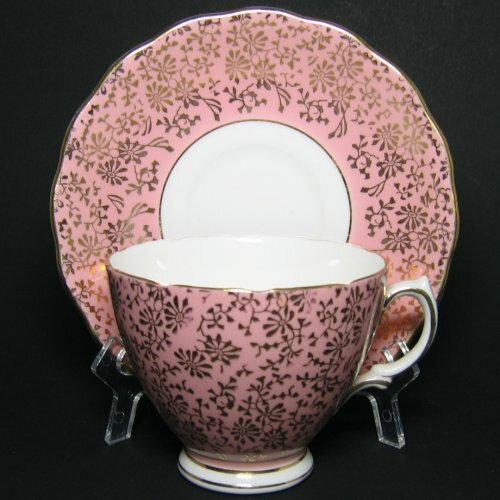 GORGEOUS bold baby pink background with heavily decorated deco style floral gilt on this beautiful COLCLOUGH set. 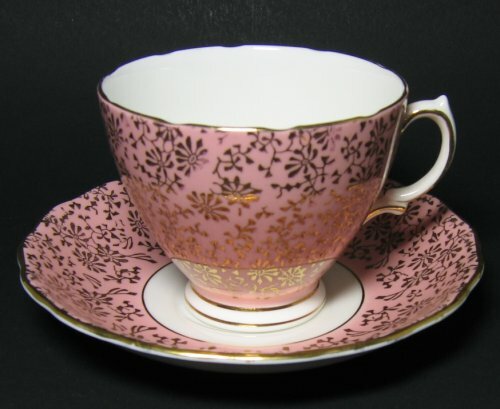 There are areas on the cup rim where the gold is painted in a finer line and does not cover the complete rim. The backstamp is circa 1960s, pink with black stamp. Pattern number 9491 with the cup stamped C6 and saucer stamped B7. The footed cup measures 2 3/4" high and 3 1/2" wide. The saucer measures 5 1/2" wide with a wavy edge. VERY LAVISH DECORATION on this set!